Checked into Flinders Medical Centre, Birthing & Assessment Suite. Were shown to Room 11. Midwife came in, seemed very nice. Poked around Briony's belly, felt the baby, told us it's in quite a good positon with the head way down low. Took Briony's blood pressure and temperature, all OK. Briony hooked up to CTG (Foetal Monitor), all looks good, baby's heart is a little fast as it keeps moving around inside the belly (perhaps doing somersaults?). Midwife offered some dinner to Briony - it was tuna, so Briony declined. Briony was offered some crackers - a packet of 3 Jatz biscuits. If we'd realised at this time just how tiring labour would be for Briony, I'd have forced her to eat something more substantial. Nurse came in to insert an IV into Briony's arm. They wanted to give Briony some fluids to keep hydration up and keep baby calm. They wanted to also take some blood. The nurse tried twice in Briony's right arm to get the IV in, it's a monster of a needle, and both times failed, leaving Briony with quite a sore arm. The nurse tried once on the left arm, failed again. Another nurse came in and did the IV, but it's in the back of Briony's left hand, it's a horrible spot and makes it hard for Briony to use her hand at all. Horrible watching this happen, as it was obvioulsy quite painful. We were a little curious about the insertion of an IV ... we had gone into hospital with "no interventions" in mind, and we suspected the IV was so they would have easier access to give Briony a drip later on. Turns out this was true, but it was also for the best as trying to get an IV into the hand while Briony's already in pain would have been quite a challenge! Midwife did a vaginal exam which hurt Briony, and then the gels went in. 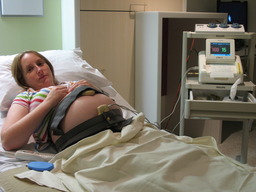 Briony got quite uncomfortable very quickly, as she had cramping pains in the abdomen (little contractions). 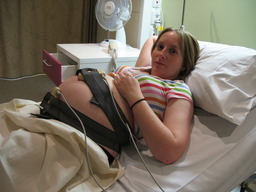 Briony can't really move, as she's hooked up to the drip and also to the foetal monitor (via cables). Went to get some food from the cafe. Briony didn't eat her bagel, only the muffin. Still in a lot of abdominal pain, plus her arms hurt, plus also she's very swollen and tender "down there". While we ate we just watched Master Chef on TV. The recipe of the night was a dessert that looked like a boiled egg on toast, but was really mango, ice cream and some mango sauce thing inside an empty egg shell. Interesting. Briony had a shower to wash "down there". The poor girl was shaking and trembling like anything ... I'm not sure if she was shivering, or whether she was in pain, or having some sort of reaction to the gels. Either way she wasn't too happy about the whole situation, but she had the shower, used the toilet and got into her pyjamas. She started feeling a bit better after just sitting down for a while. Eventually she got into bed. Callan went home. Midwife told Briony she's coming back at 1am to put the foetal monitor on again. The midwife didn't do the foetal monitor. No big drama I guess. Briony woken up by a midwife with a torch. Briony had the earplugs in and never heard the midwife come in, and was a little startled when she just woke up and there was another person shining a light around the room. Another woman came into the Birthing & Assessment Suite, screaming. Apparently she was on her way to Womens & Childrens Hospital but didn't make it. 15 minutes and a lot of screaming later, her baby was born. Another vaginal examination (yay) and some more gels. Callan arrived with a large coffee in hand. Briony laying in bed, hooked up to foetal monitor. Everything looking okay. Briony's breakfast is a cup of tea, 2 weetbix, a piece of bread and some apple juice. She scoffed it all. And two milky way bars, although these days the fun size bars aren't much fun. Briony gets on facebook. At least she's comfortable anough to use the laptop. Briony has a shower, feels better. Notices that her feet and toes are swollen. Midwife did some checks on Briony - blood pressure OK, temperature OK, CTG / foetal monitor OK, they are going to try to break Briony's waters at 1300. Midwife at this stage is Amy. She was nice, however her attitude was a bit funny. Whenever we talked about things such as wanting to have as few interventions as possible, she seemed to agree a little carelessly, as if she was just agreeing to keep us quiet, but secretly she didn't really agree. It turns out our fears were completely unnecessary as Amy was absolutely awesome and fabulous, and we both really missed her care when the midwife swapped shift later on. Neither of us have had lunch. Amy said Briony has to drink lots to stay hydrated. Amy did a vaginal examination - Briony's cervix is at 1cm, perhaps not enough to break Briony's waters with the "crochet hook". Another doctor came in for a second opinion, did another vaginal examination which Briony wasn't really impressed about. But the good news is the second doctor said the cervix is open enough for the procedure, and 5 minutes later Briony's waters were broken. From where I was sitting it looked like it was REALLY painful. There was quite the gush of fluid too! Amy changed the CTG / foetal monitor to use the wireless transmitters. This was a blessing, as Briony could then walk around (slowly) and change positions without becoming tangled in the cables. The only downside is the whole setup is quite sensitive - if Briony got in the wrong position just for a moment, the sensors would not pick up the foetal heartbeat any more and the machine would go into warning status. Another quick movement though, and all was well again. Amy's comments at this time were - stay upright, move around lots, and one hour until Syntocin drip goes into Briony's arm. As this is one of the interventions we wanted to avoid, we asked if there was a time limit. Amy said "protocol" is 2 hours from the time waters are broken, if there's no progress then the drip happens. Per my comments above, at this time of the day we still weren't convinced that Amy wasn't a "clinical" midwife. Contractions started. Briony hurting a bit. By 1500 hrs the contractions were regular and painful. Contractions now less regular and less painful. That's not a good thing. Syntocin drip administered, as Briony's contractions were only 2 in every 10 minutes. 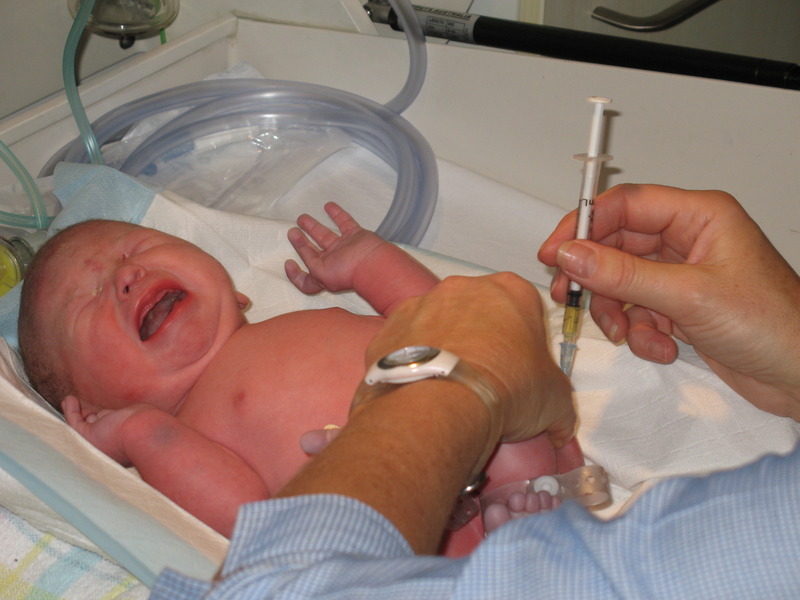 Labour begins thanks to the Syntocin drip. Briony was getting regular, painful contractions. We followed our Doula's advice and arranged for Briony to sit on a gym ball at the foot of the bed, and rest her head in a pillow on the bed. This position definitely helped. We also put on Briony's TENS Machine, which she found VERY useful. Labour continues. Our Doula (Helen) had to go, as she had another birth to attend (naturally Doulas only book one birth at a time, but as Briony was induced 3 weeks early she then conflicted with another of Helen's clients). The backup Doula was Kat, and she turned out to be absolutely fantastic, in fact I'd go as far as to say absolutely perfect. Kat helped Briony to apply some hot packs, including this wheat bag belt, which looked like something a suicide bomber would strap to themself. It all helped though. The TENS machine was still offering excellent relief from the pain of contractions as the Syntocin drip was being turned up to a stronger dose continually. The contractions were getting very painful now. Briony was hot and hurting, we had the fan blowing on her and were wiping her face with cool face washers. Briony was in so much pain that she did want some pain relief. Amy asked what Briony had in mind, to which Briony suggested an epidural. Amy suggested that an epidural was quite a big decision, and could be "setting yourself up for failure". By now we knew Amy was excellent and was giving honest advice while also respecting our birth plan. Amy suggested Briony might like to try pethadine instead, as she can arrange that very quickly, Briony would still be able to move around freely, and it's the least invasive of the pain relief options. I agreed with her recommendation, so did Briony, and so 5 minutes later Briony got the (rather large!) injection. She said it didn't really do much, but of course that's coming from someone that's in ever increasing pain, so perhaps the injection didn't stop the pain, just rather made it more bearable. Only Briony would know that. Labour continues. Briony makes a comment "I feel like I need to poo, but I can't be so soon". We knew that the baby coming often feels like the need to poo, but Briony thought this could not be the case as labour had only been going for 3 hours. Next thing Amy's got the trolley out with a delivery kit on it, and opened up the baby resucitation table, just in case. Amy suggested Briony might be having involuntary pushing, which could mean baby is coming. Briony making lots of straining noises. Vaginal examination shows cervix is dilated, and Amy felt the baby's head. Briony got off the gym ball, up onto the bed, on all fours. The noise continued, she was still in some pain, but by this time it looked more like effort rather than pain. Amy had to go home (end of shift), and we got a new midwife called Jennifer. She was a bit mean actually. Well, not mean, but quite full-on and obviously a very strong person. It came as a bit of a shock compared to Amy, from whom we had felt nothing but genuine care and gentleness. Jennifer used words such as "if we don't get this baby out, there are doctors outside and they are going to come in". We knew exactly what she meant, and we knew she was right, but the way she said it was pretty harsh - I could take it, but I think for the woman in labour a slightly friendlier tone would be more reassuring and productive. 2230 hrs Jennifer asked Briony to roll onto her side. Briony was not at all happy about this, but complied anyway. This didn't help speed things up, so she got back onto all fours. Changing positions was obvioulsy not easy for Briony while labouring. At the time we wanted Jennifer to just leave us alone, but we do now realise that she only wanted to get the baby delivered. Lots of really hard pushing going on here. This was probably the hardest bit of the labour for both of us. I'd seen Briony in pain all afternoon, which wasn't nice, but the pain was only for a few moments at a time. This pushing business though, I could see it was just absolutely exhausting for Briony. She was puffing and panting, hanging her head, and looking just tired out. I could see she was working harder than she had ever worked in her life, and that was quite emotional for me. Briony told me the next day that she was so tired she couldn't push properly any more, and was pretending a contraction was finished when it really wasn't, because if the doctor found out she was tired out then they'd send her for a caesarean. We had another doctor, Dr Alison, come in and talk with us. Next thing Briony's legs are up in stirrups (which hurt! ), another vaginal examination was done (which also hurt), and Briony was still pushing and pushing. Dr Alison told Briony to push quietly, and making noise wastes energy. Kat (Doula) and myself were just talking with Briony at this stage, offering encouragement and saying PUUUUSH in her ear, and offering our hands for Briony to squeeze. And forcing Briony to drink. By this time there's Jennifer the midwife, plus 3 other doctors in the room, Briony's on her back with legs up in the air, and there's a bright light shining right down there. Next thing I know the doctors have the Ventouse machine out, which was okay with us as that meant there was an obvious choice - ventouse, forceps or caeserean. The ventouse was inserted (perhaps "shoved" is a better word) into Briony. All I can say is thank heavens she got an injection of local anaesthetic. With each push that Briony was doing, Dr Alison was pulling HARD on the ventouse. Eventually I saw the suction cap half-delivered, with a baby's head attached. 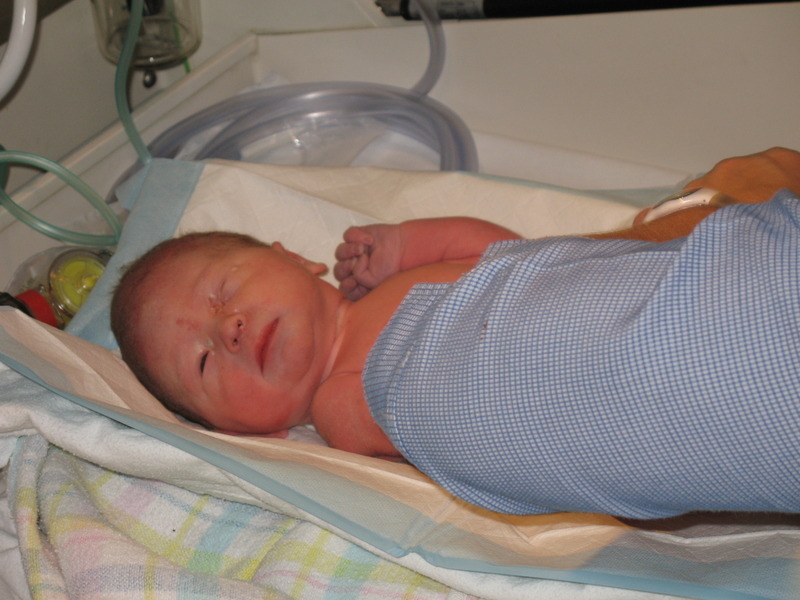 Dr Alison told us she was making a small cut, which meant episiotomy. It was good that she told us, but of course we didn't have a choice in the matter. With a lot more pushing and tugging on the ventouse machine, our baby daughter was born!! 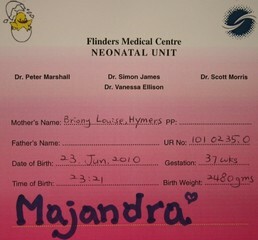 Everyone asked if we'd chosen a name, to which Briony proudly answered "Majandra". To all those reading this blog, the "j" is pronounced like a "h" - so it's pronounced Ma-hahn-dra. 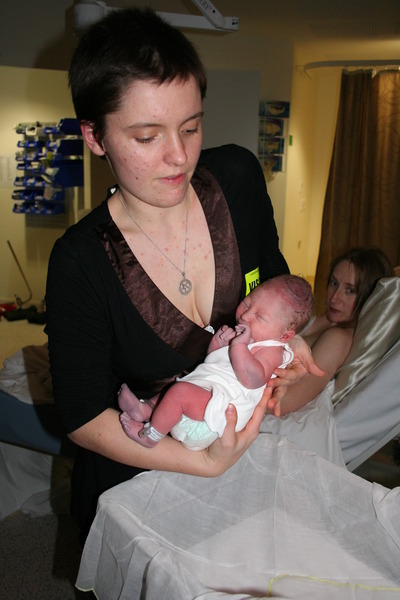 After the birth, our baby was placed onto Briony's chest. I was very teary-eyed. It was full and fast action, baby on the chest, husband/father crying, doctors stiching Briony up, and Jennifer the midwife getting the baby table ready. I got to hold our daughter too, with my shirt off for some skin-to-skin contact. The whole birth was very quick and very overwhelming. I also have to write something here that's funny yet silly. When I held Majandra for the first time I looked at her with nothing but love, but I noticed one strange thing - her left eye was covered over by skin, she only had one eye! I could see the eyeball moving underneath, but there was no eyelid, just a flap of skin. I showed Kat (Doula) and the midwife and told them not to tell Briony, but our daughter has a problem. 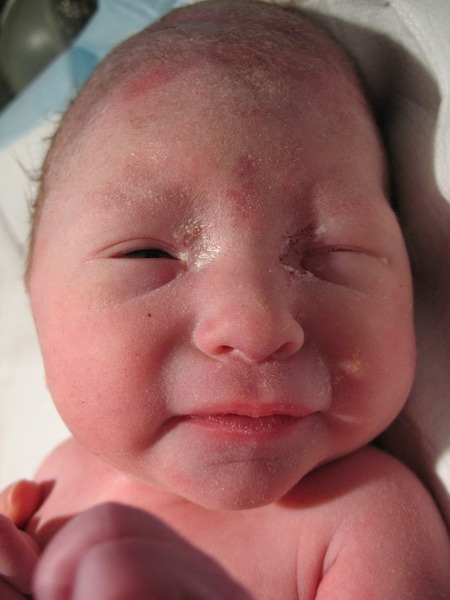 Jennifer the midwife quicly responded that it's just the sticky Vernix from the womb, which has made the eyelids sticky and there are actually eyelids there, they are just stuck together. Not even 5 minutes later and I could see she was right ... Majandra's eye opened a bit. Talk about silly me! In my mind it doesn't seem that Briony and I were allowed to hold our baby for an hour, but that's what I've got written in my little book. So at 0045 hrs Majandra was measured (47cm), weighed (2.45Kg) and given her Vitamin K injection. She wasn't too happy about the injection! Majandra was taken to the nursery for the routine heel-prick blood test. I went with her, while Kat (Doula) stayed with Briony. In the nursery I met Dr Liza, the pediatrician. She explained that Majandra was quite small, and just under their 2.5Kg limit, which meant she had to stay in the nursery overnight. Jennifer also showed up in the nursery. Her and Dr Liza asked me how Briony woudld take it if they suggest keeping Majandra in the nursery. I told them it'd be OK. So we all went back to the birthing room, and the doctors told Briony the situation. Majandra was taken to the nursery, accompanied by Callan. Briony was brought to the nursery in a wheelchair, pushed by Jennifer the midwife and accompanied by Kat (Doula) in her bathers. While I had been in the nursery alone, Kat had helped Briony to have a shower and get cleaned up, and Jennifer had arranged for all our stuff to be packed up onto a trolley. I think we just spent an hour in the nursery, perhaps we tried to breast feed, I'm not sure ... it was 3am afterall! We were taken to the post-natal ward on level 4, it's called Ward 4C. We were shown to room number 7, our stuff was brought in, and we got ready for bed. I had a fold-out bed which was old but comfortable. I was laying there for a little while, and I clearly remember hearing Briony sound asleep within 5 minutes of getting into bed. It'd been a long day!